What is ‘news’? Worldwide events AND friends’ everyday thoughts: In their daily behavior, most students around the world didn’t discriminate between news that say The New York Times, the BBC or Al Jazeera might cover, and news that might only appear in a friend’s Facebook status update. ‘News’ meant ‘something that just happened’ – and students wanted to know what that was, whether it was globally momentous or only of personal interest. ‘We no longer search for news, the news finds us‘: No matter where they live, the amount of information coming into students via their mobile phones or the Internet – via text message, on Facebook, Twitter, chat, Skype IM, QQ, email, etc. – is overwhelming; students are inundated 24/7. 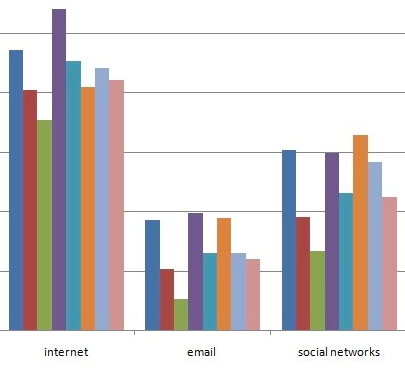 As a result, most students reported that they rarely go prospecting for news at mainstream or legacy news sites. They inhale, almost unconsciously, the news that is served up on the sidebar of their email account, that is on friends’ Facebook walls, that comes through on Twitter. ‘140 characters of news is all I need’: The non-stop deluge of information coming via mobile phones and online means that most students across the world have neither the time nor the interest to follow up on even quite important news stories – unless they are personally engaged. For daily news, students have become headline readers via their social networks who only learn more about a story when the details or updates are also served up via text or tweet or post. Read all about it: Compared to other types of media in this study, news was mentioned relatively infrequently by students. Those who did mention it commented that they missed being able to “stay up on the news.” What they meant by this, however, seemed to vary from person to person. A few students lamented that they were missing the daily coverage in newspapers, magazines and blogs. But at least as often, when the word “news” was mentioned it didn’t mean information coming from journalists but rather updates from their friends and family via e-mail, text messages and social networking sites. This trend was particularly noticeable among the U.S. students, who typically seemed to define “news” as “what’s happening among their peers.” This finding confirms that the definition of news is in the midst of significant evolution. No problem going without hard news: Because Facebook, Twitter, Gmail and their counterparts are increasingly the way students reported getting their news and information, students were cavalier about any need for traditional news outlets. Very few students mentioned any legacy or online news outlet by name – and those that were mentioned tended to be sports outlets referenced by American students. While all the students expressed an interest in being and staying informed, it was a minority of students in any country who complained about having to go without local, national or world news for a day. Some students noted that they missed a news outlet’s 140-character Twitter updates, but they weren’t desperate to read or surf to the New York Times or its equivalents. To many of them “newspapers,” for example, were just another media platform to be mentioned in the same breath as Facebook and Xbox. Missing Social News: What appeared to matter most to students was their being behind in the news about their friends and family. Students wanted “news,” yes, but the term was blurred in their minds, as the same platforms – Facebook, Twitter, emails, texts – that carry their personal news, also are the ways in which students get the bulk of their daily “hard” news, too. 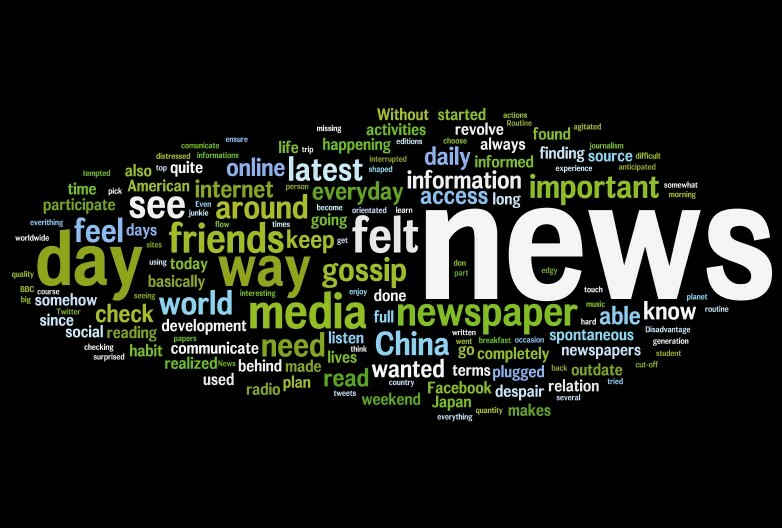 Missing traditional news coverage: Although relatively few students, in any country, mentioned that they were desperate to follow news coming from traditional publications, there were some who wrote that keeping up with the news is an important part of their day.